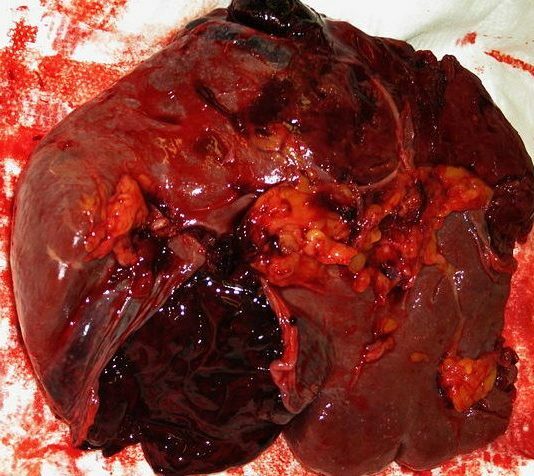 The spleen is an extremely vascular organ and consequently splenic rupture can cause large intraperitoneal haemorrhage, rapidly leading to fatal haemorrhagic shock. Whilst protected by the ribcage (Fig. 1), the majority of cases of splenic injury are secondary to abdominal trauma, in particular blunt trauma. Common situations in which the spleen is injured include seat-belt injuries in road traffic collisions and falls onto the left side (such as patients slipping on ice or elderly patient falling in the bathroom). A minority of cases are iatrogenic, or secondary due to underlying splenomegaly from haematological malignancy or infective causes (such as Epstein-Barr virus). 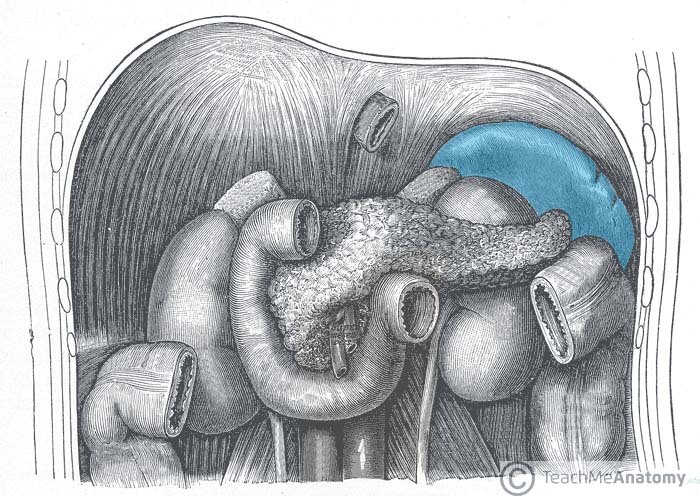 In these cases, as the spleen grows in size, the capsule stretches and thins, becoming more fragile. This puts it at an increased risk of rupture. Diagnosis is most commonly made from the investigations of abdominal pain following a history of trauma. Patients may complain of abdominal pain or clinical features of hypovolaemic shock, but only imaging will confirm the diagnosis. On examination, patients may have left upper quadrant tenderness and / or peritonism (which will become more generalised as the blood loss increases). Free blood can irritate the diaphragm and cause a radiating left shoulder pain (known as Kehr’s sign). Patients who are haemodynamically unstable with peritonism following trauma have abdominal bleeding until proven otherwise and require immediate laparotomy. 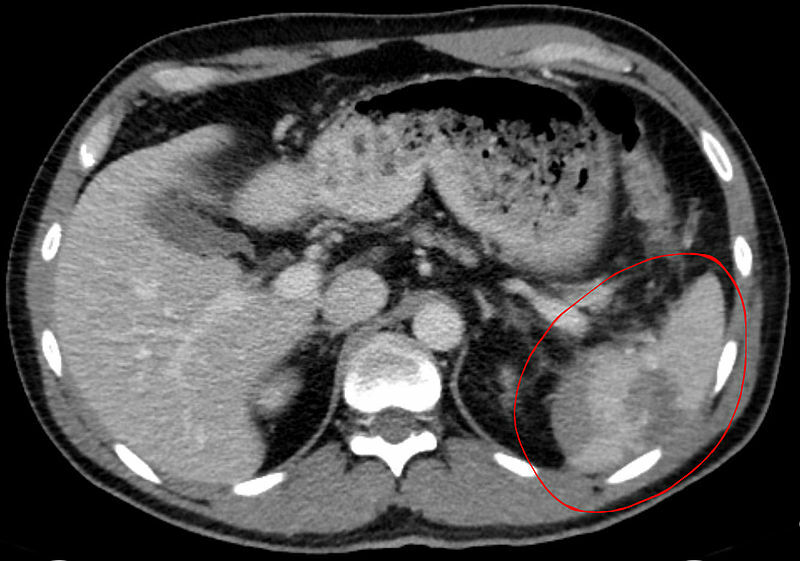 CT scans allow for the identification and assessment of splenic injury, alongside any other abdominal viscera involvement. Specifically, it also allows for the grading of the splenic injury to guide further management. FAST scans in the emergency department setting can reveal free peritoneal fluid or fluid in the pericardium. However, whilst a potentially helpful adjunct, they should not delay CT imaging and / or surgical intervention. The American Association for the Surgery of Trauma (AAST) splenic injury scale (Table 1) is the most commonly used system for grading splenic trauma. It is used to help guide which patients are likely to benefit from conservative management and which need surgery. – Subcapsular >50% surface area, or intraparenchymal >5cm, or any expanding or ruptured haematoma. All patients with suspect splenic injury should be assessed, resuscitated, and treated according to ATLS principles. Patients who are haemodynamically unstable* or with a grade 5 injury (a shattered spleen or major hilar vascular injury) need urgent laparotomy. Haemodynamically stable patients with grade 1–3 injuries without active extravasation can be treated conservatively. They should be resuscitated using the principle of permissive hypotension, admitted to a high dependency area for observation, and have serial abdominal examinations for any evidence of deterioration. The patient should be placed on strict bed rest and have a repeat CT scan at 1 week post-injury. With any evidence of increasing tenderness or peritonitis, there should be a low threshold for re-imaging and / or laparotomy (as associated injuries such as small bowel injuries are easily missed on initial CT imaging). All patients who are treated conservatively should receive prophylactic vaccinations (against Strep Pneumoniae, Haemophilus Influenzae B (HIB) and Meningococcus) at discharge. *If there is evidence of active extravasation of the contrast during the arterial phase of the CT scan, the patient should undergo embolisation (if locally available) or laparotomy with splenectomy. Patients with vascular abnormalities or higher grade splenic injuries may benefit from embolisation of the splenic vessels. This aims to decrease the rate of laparotomy and splenectomy, however it is not always possible to see the bleeding point. Indeed, even when a vessel is embolised, there is still a small proportion who goo on to requiring splenectomy. 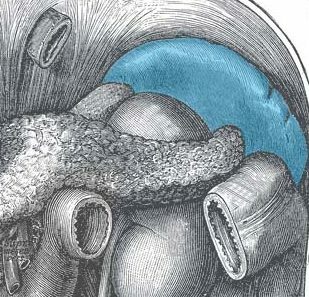 The spleen is an immunologically active organ, with an active role in destroying encapsulated organisms, such as Pneumococcus, Meningococcus, and H. Influenzae. Asplenic patients are therefore unable to mount a normal immunological response against these organisms and infection can lead to overwhelming sepsis. Consequently, any asplenic patient, including those post-splenectomy, should receive vaccinations against these three organisms. In addition, prophylactic Penicillin V should be considered (this may not be required lifelong in low-risk patients). Patients who are not haemodynamically unstable with suspected abdominal or chest injuries need an urgent CT chest / abdomen / pelvis with IV contrast. Patients who are haemodynamically unstable or with a grade 5 injury (a shattered spleen or major hilar vascular injury) need urgent laparotomy. Pain in the left shoulder is considered a classical symptom of a ruptured spleen and is commonly known as what? A 40yr old man is admitted following a car crash to A&E and a ruptured spleen is clinically suspected. What imaging modality is best for definitive assessment? Following splenectomy, which of the following pathogens does not require consideration for prophylaxis?